Congratulations, Maryland. You have succeeded in turning a financial mess of an athletic department into a swank new home. And congratulations to you, too, Rutgers. It appears you're next. Your reward for running up a staggering debt is a huge conference upgrade. Location, location, location. That's what this latest round of conference realignment is about. Two largely underachieving, financially irresponsible athletic programs are parlaying their geographic proximity to major metropolitan areas into membership in the Big Ten. They've done very little on the field of competition to deserve it. But that's not what drives conference affiliation these days. College Sports, Inc., is no meritocracy. Rutgers and Maryland might as well be the airline and automotive industries. They're losing money left and right, but because they have inherent value (thanks to their TV markets of New York, Washington D.C. and Baltimore), here comes the institutional bailout. Maryland is facing a $50 million exit fee from the Atlantic Coast Conference, just months after dropping seven athletic programs in July in an attempt to get itself out of multimillion-dollar debt. The students who worked year-round to compete in those programs – and who tend to graduate at a high rate – were expendable in order for the Terrapins to keep up with the Joneses in revenue sports. If the Under Armour booster cares more about 57 combinations of football uniforms than having a swim team, it's expendable. 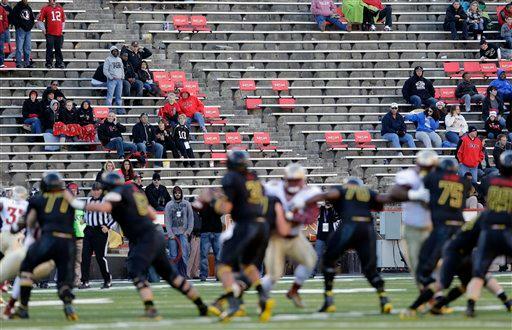 In the last decade, Maryland expanded its football stadium to 54,000 and built a palatial basketball arena in order to chase additional glory and cash. It acquired neither. While spending increased 24 percent over the last five years, according to the Washington Post, revenues increased only 15 percent. All the money and gear in the world hasn't been able to make the Terrapins anything other than a gridiron embarrassment the past two years. They're 6-17 under Randy Edsall, who is being paid $2 million a year for that record. And while Maryland will immediately become the most recent Big Ten school to win a basketball national championship (2002), it hasn't accomplished much recently in the school's signature sport, either. 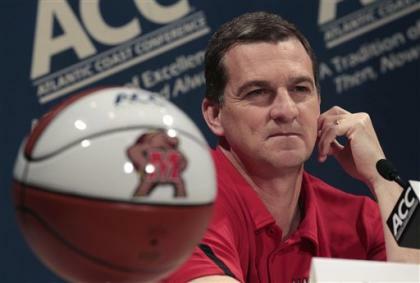 The Terrapins missed the NCAA tournament last season, their first under Mark Turgeon ($1.9 million annually), and have missed four of the past seven tourneys. Next up, you can count on Maryland asking the ACC to negotiate a smaller buyout than the $50 million the league voted on way back in September. And the ACC will probably oblige, for reasons that make no sense to anyone. This is College Sports, Inc., economics at work – where every buyout is just a number on paper and not a commitment. Whatever the final exit fee is, it's still an expensive proposition for an athletic program swimming in red ink. Of course, Rutgers has been that red-ink pool for so long its fingers are pruned. It cut six sports programs in 2007, and then proceeded to run up even more debt in the years that followed. The Newark Star-Ledger reported that Rutgers athletics spent $26.8 million more than it earned in 2010-11 – a staggering display of financial recklessness that was in part foisted on the general student population via additional fees and tuition. The payoff for that expenditure was exactly zero Big East championships in any sport in 2011-12 – but then again, the conference offered only 35 of them. Most of that money has been sunk into football, which is the sport that determines everything these days. Until this season, Rutgers had been an AP top-25 program for one week in the last four years. Right now the Scarlet Knights are 9-1 and have a chance to win their first Big East championship with two more victories – but the program's long-term viability remains an unknown after architect Greg Schiano left last winter for the NFL. So the reward for spending a ton of money and winning nothing is the chance to flee the floundering Big East for the security and profitability of the Big Ten. Everyone in Piscataway should look at the skyline to the East and thank New York for being where it is. I'm not blaming Maryland or Rutgers for doing what they're doing – although the Terrapins are chucking 60 years of ACC tradition out the window in exchange for fan-friendly trips to Nebraska, Minnesota and Iowa. They need money, and the Big Ten has money. But neither school should act as if they earned this upgrade via excellence on the field. What does the Big Ten get in return? Nothing in terms of competitive enhancement. It gets a further erosion of its geographic identity (as if that still matters), a toehold in some new recruiting soil and the chance for Jim Delany to tell Mike Slive he can go to 14 schools, too – so there. The fact that both Maryland and Rutgers are in the American Association of Universities allows the academic folks in the Big Ten to countenance this, but that's just window dressing. Avarice and ego are what drives realignment, at further cost to college sports' soul. After watching the Pac-10 become the Pac-12, the SEC add two schools, and the Big 12 and ACC both raid the Big East, it was the Big Ten's turn to make another greedy power play. Maryland and Rutgers are the beneficiaries, somehow turning years of reckless spending and faulty leadership into a conference upgrade – all because of location, location, location.